NASA’s first spacecraft designed to return a piece of an asteroid to Earth arrived Friday, May 20, at the agency’s Kennedy Space Center in Florida, and has begun final preparations in advance of its September launch. The Origins, Spectral Interpretation, Resource Identification, Security – Regolith Explorer (OSIRIS-REx) spacecraft will undergo final testing and fueling prior to being moved to its launch pad. The mission has a 34-day launch period beginning on Sept. 8. After launch, the OSIRIS-REx spacecraft will travel to the near-Earth asteroid Bennu and retrieve at least 60 grams (2.1 ounces) of pristine surface material and return it to Earth for study. Scientists expect that Bennu may hold clues to the origin of the solar system and the source of the water and organic molecules that may have made their way to Earth. 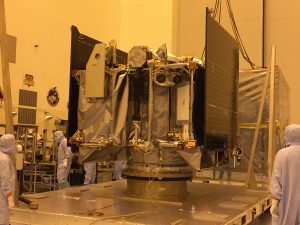 Over the weekend, the team transferred the spacecraft from the shipping container into a cleanroom and performed post-ship inspections to confirm that OSIRIS-REx arrived in good condition. The spacecraft is ready to begin its final round of testing and pre-launch checks, which are scheduled to commence later today when it will be installed onto a spin balance fixture. Further checks prior to launch will include software tests, instrument and power functional tests, spacecraft self-tests and deployments of the spacecraft’s solar panels. After launch, the OSIRIS-REx spacecraft has an approximately two-year cruise to reach Bennu in 2018. 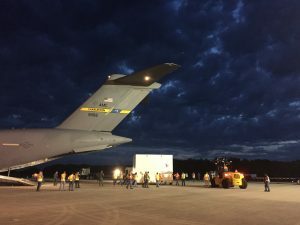 Upon arrival, OSIRIS-REx will spend two years conducting surface mapping and sample site reconnaissance operations before performing the sampling maneuver in 2020. OSIRIS-REx will then deliver the pristine sample of Bennu back to Earth in 2023. NASA’s Goddard Space Flight Center in Greenbelt, Maryland, provides overall mission management, systems engineering and the safety and mission assurance for OSIRIS-REx. Dante Lauretta is the mission’s principal investigator at the University of Arizona. Lockheed Martin Space Systems in Denver built the spacecraft. OSIRIS-REx is the third mission in NASA’s New Frontiers Program. NASA’s Marshall Space Flight Center in Huntsville, Alabama, manages NASA’s New Frontiers Program for the agency’s Science Mission Directorate in Washington. Launch and countdown management is the responsibility of NASA’s John F. Kennedy Space Center in Florida.